Diagram of a triangular sail. In a triangular sail, the upper point is known as the head; the halyard, the line which raises the sail, is attached to the head. The lower two corners of the sail, on either end of the foot (the bottom edge of the sail), are called the tack (forward) and clew (aft). The tack is shackled to a fixed point on the boat, such as the gooseneck in the case of a Bermuda rigged mainsail, or the deck at the base of a stay, in the case of a jib or staysail. The clew of a jib or other headsail is the free corner (not attached to any standing rigging), to which port and starboard jib sheets are attached to control the angle of the sail to the wind. On a square sail or a symmetrical spinnaker, each of the lower corners is a clew, but the corner to which the sheet (the working sheet or leeward sheet) is currently attached is called the clew. The foot of a sail is its lowest edge, bounded by the clew and the tack, or on some sails by the two clews. The forward (leading) edge of the sail is called the luff. This is related to the term luffing, which is a condition where the sail ripples because wind is crossing over the front and back side simultaneously, caused when the angle of the wind fails to allow the sail to maintain a good aerodynamic shape; this condition usually starts near the luff as the boat passes through being close-hauled. A cunningham may be rigged on the luff of the mainsail to help control the sail shape. 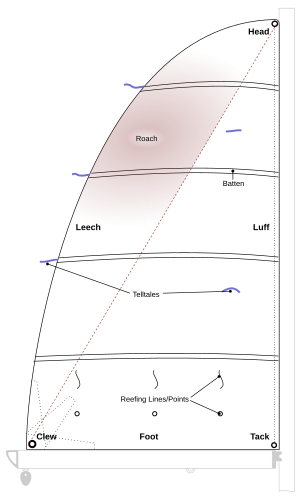 The aft edge of a sail is called the leech. If incorrectly tensioned, the leech of a sail may "flutter" noisily; some larger mainsails are provided with a line which runs along a pocket in the leech, called a leech line, for the purpose of tightening the leech to prevent this fluttering. The shape of a sail is seldom a perfect triangle. It is common for sailmakers to add an arc of extra material on the leech, outside a line drawn from the head to the clew. This additional part of the sail is known as the roach; mainsails usually have roaches, but they are very occasionally found on specialized jibs as well. They provide additional power for a given mast/boom size. Since it cannot be supported by tension in the sail material (applied from the corners), it would flap uselessly unless some other provision was made for it. It is therefore supported by battens, held in batten pockets, which extend into the main portion of the sail. The corners of a quadrilateral fore-and-aft sail. Gaff, gunter, lug, junk and some sprit sails have four sides and are set fore-and-aft so that one edge is leading. The throat is the upper, forward corner of the sail. The peak is the upper aft corner. Gaff rigged sails, and certain similar rigs, employ two halyards to raise the sails: the throat halyard raises the forward, throat end of the gaff, while the peak halyard raises the aft, peak end. The tack is the lower forward corner of the sail. The clew is the lower aft corner. The four edges of a sail are likewise independently named. The foot, as in a triangular sail, is the bottom edge of the sail, which runs roughly parallel to the deck. The foot is often attached, at the tack and clew, to a boom; if no boom is present, the sail is said to be "loose-footed." The head is the upper edge of the sail, and is attached at the throat and peak to a gaff, yard, or sprit. The luff is the forwardmost vertical edge of the sail, which runs along the mast. The leech is the aft vertical edge of the sail. The parts of a square sail. Many of the same names are used for parts of a quadrilateral square rigged sail. As for a triangular sail, this refers to the topmost part. On a square sail, however, this part is an edge rather than a corner. The "side" edge of the sail. Since square sails are symmetrical, they have two leeches. Occasionally, when the ship is close-hauled, the windward edge of the sail might be referred to as the luff. Like a triangular sail, the "free" corners of a square sail are called clews; again there are two of them. Square sails have sheets attached to their clews like triangular sails, but the sheets are used to pull the sail down to the yard below rather than to adjust the angle it makes with the wind. The bottom edge of the sail. Square sails also have tacks and sheets, although they are not a part of the sail itself. Square Viking sails included a stiffening bar called a beitass. 'Clew lines' are ropes attached to the clews, and 'clewgarnets' or 'cluegarnets' are the tackles attached to clew lines. These lines and tackles are used to ‘clew up’ the ‘courses’ of a square sail (ie to pull the clews up onto the upper yard or the mast in preparation for furling the sail). This page was last edited on 12 July 2010, at 15:13.